Jojendi Guest House is situated in one of Johannesburg’s Northern suburbs called Linden, which is also part of Randburg. Linden is a quiet residential area. 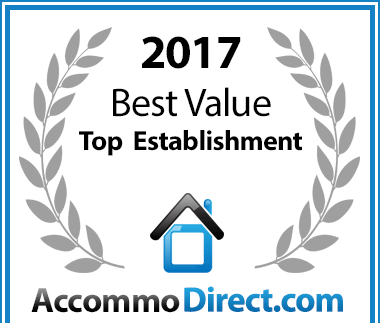 The accreditation of this top 3 Star accommodation was accepted by ‘The South African Tourism Grading Council’ as well as ‘The NAA’ (The National Accommodation Association of South Africa) and also forms part of ‘The Gauteng Combined Accommodation Association’. Jojendi Guest Suites offers you a unique combination: Best of Both: Bed & Breakfast in the Dining Area and a basic kitchenette in all units, as a bonus. You have the opportunity to enjoy the peaceful garden as well as the adjoining outside communal area. We offer sufficient secure parking for one vehicle per unit, residents only. Jojendi is centrally located. Most of the main business, conference, and shopping as well as entertainment centers are easily reachable. Jojendi Guest House has been voted a Best Value Establishment for Guest Houses in Johannesburg.